Are you in a competition to see how many tasks you can juggle or how busy you are? We tend to think we are better at multi-tasking than brain studies indicate. We may not believe the research until we have a near miss while texting and driving. People’s smartphone absorption can leave them oblivious to their surroundings, as one man discovered when he walked off the metro station platform and fell six feet onto the train tracks while texting. My granddaughter’s infant bath sitter carries a warning about not using the phone while the baby is bathing. In fact, the device came from overseas because of fears of distracted caregivers in the US. And who hasn’t heard about children accidentally forgotten in car seats and dying of hyperthermia. We think these things can’t happen to us. According to scientists, humans can only concentrate on one thing at a time or pay intermittent attention to a small number of things. Think of working memory as available slots or capacity. Most people’s limit is seven (like 7 digit phone numbers or 8 digit social security numbers). Like a juggler who can keep no more than 7 balls airborne, the next thought or action displaces one of the seven. When we exceed our threshold, we become forgetful, with sometimes fatal results. People who pride themselves on multi-tasking, are simply making micro-transitions between one task and the next. Brigid Schulte, a Washington Post staff writer, has written a book “Overwhelmed: Work, Love, and Play When No One Has the Time.” An excerpt that recently appeared in the Post contained the remark, “The compulsion to multitask was making us as stupid as if we were stoned.” http://www.washingtonpost.com/opinions/why-being-too-busy-makes-us-feel-so-good/2014/03/14/c098f6c8-9e81-11e3-a050-dc3322a94fa7_story.html The overwhelm frenzy impedes our well-being and productivity and has a harmful impact on those around us. For me, the Just One Thing (JOT) I need to pay attention to is acquiring information. I tend to jump from interest to interest, abetted by access to books and the internet. I scan the environment for topics, then dive into details until the next project tantalizes, and off I go, leaving unfinished projects languishing. I am conscious of my attention deficit tendency, so I limit inputs, like forgoing cable television, deliberately. I cannot give birth to every potential in my soul. The stockpile of waiting projects and plethora of ideas leads to overwhelm. Unless I proceed methodically, little actually gets accomplished. In order to complete some things, I have to release undertaking everything that catches my fancy. • Honor your working memory. Focus on seven things or less. • Try single tracking. 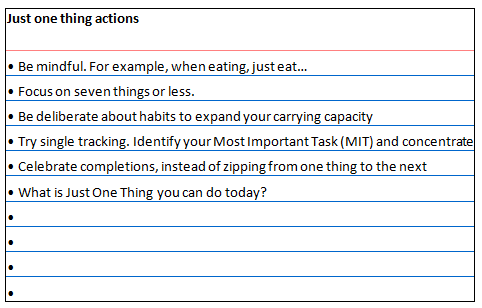 Identify your Most Important Task (MIT) and concentrate on that before tackling the next. How about you? Is there an area in your life where Just One Thing would help?